Stephen G. Fritz is Professor of History at East Tennessee State University, and produces solidly written and researched history on the subjects of Germany and the Second World War. His academic and scholarly success seems to come from within, and is the result of hard work instead of patronage, devotion to a particular cause, or association with a perceived wellspring of scholarly genius. 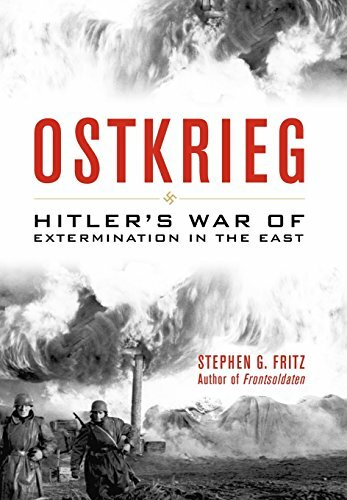 Like the other fruits of his labor, Dr. Fritz’s latest work, Ostkrieg: Hitler’s War of Extermination in the East, is all the more valuable as a result. Early on the morning of June 28, 1940, one week after the execution of the Franco-German armistice, Adolf Hitler and a small entourage that included Albert Speer and Arno Breker took a brief tour of some of the more well known cultural sites of Paris. The Fuehrer was at his ease, surrounded by his security detail and showing off his knowledge of the artwork encountered along the way. This little vignette, as related by Dr. Fritz in Ostkrieg, informs the reader in somewhat cryptic fashion both as to the author’s thesis and the mind of his subject. Concerning the mind of Adolf Hitler, even a casual student of the Second World War must face the question of whether the German Fuehrer was possessed of all his faculties when he decided to launch the single largest and most violent military operation in history, thereby putting at risk all that he had already achieved. And as for Stephen Fritz, his thesis might be boiled down to this: The Ostkrieg was Hitler’s war. Here we do not allude to the fact that the dictator immersed himself in the micromanagement of that war almost from its beginning. Adolf Hitler most certainly did this, but that is not the point. The Fuehrer “owned” the Ostkrieg because it was the “real” war, the conflict that came from his heart and soul, the crusade that expressed the essence of his being, the cause for which he had been brought into the world. Ostkrieg is probably not for the casual reader. Its narrative runs to 500 pages, while the footnotes and bibliography (vital to some, but often of little interest to others) consume another 100 pages. And notwithstanding the author’s protestations to the contrary, Dr. Fritz did in fact generate a work based on both original research and the use of secondary works. Fritz’s original sources—the original war diary of Franz Halder, the speeches of Adolf Hitler, the diaries and letters of German soldiers in the field, the diaries and records of the German Armed Forces high command, the daily record kept by Joseph Goebbels, and other like material—have been treated as such by many scholars in the field. Stephen Fritz brought to his sources his considerable analytical skills and clarity of expression. The product is a very readable consideration of the European war’s most important front, and one that expresses a new understanding of its causes and effects. Dr. Fritz is not the first scholar to bring to the fore the complex obsessions that enslaved Adolf Hitler’s mind, nor is he the only one to associate those obsessions with the war the Fuehrer made. He is the first, however, to correctly connect Hitler’s obsessive character with specific decisions made by him that determined the fate of Germany and the lives—and deaths—of tens of millions of Europeans. Adolf Hitler’s conviction that “international Jewry” controlled the course of human events, and aimed to eradicate Germany and the German Volk, was the root cause of the war that forever altered western culture. For the Fuehrer, Jewry was a contagion that must be eradicated forever, and failing that, at the very least removed from Europe once and for all. Initially, however, Hitler confronted the not insignificant problem of the Versailles Treaty and Germany’s resultant military weakness. Hitler resolved this problem during the period 1938–1940, expanding the borders of the Reich and removing from the equation as military threats not only Poland, but also France and—for the moment at least—Great Britain. Nevertheless the German victories of 1938–1940, both diplomatic and military, seemed in some ways to have multiplied Germany’s problems, rather than allay them. The fundamental issue, in the view of Hitler and his toadies, was that the string of victories merely added substantially to the number of Jews under German control without providing the means to deal with them. By this point in time the Nazis’ options for resolving the “Jewish problem” were fast shrinking, in part because their efforts to deport the European Jews had run aground on the inability, particularly with Britain still in the war, of the German armed forces to mount a successful campaign to seize the island of Madagascar and make use of it as an appropriate haven for the Jews. If the Jews could not be removed physically from Europe, then Germany must expand the reach of its control still further, and that could only be accomplished through the use of force, which must be applied to Ukraine and the rest of European Russia. And in this case time was of the essence, since Great Britain had chosen to continue its fight, and more importantly would have the greatest opportunity to persuade the United States to join in the struggle on the side of Britain. Finally, if the war went badly for Germany, as it began to do in December 1941, this could only be the result of the machinations of “international Jewry.” If the Jews of Europe therefore could not be pushed out, Nazi Germany would be forced to adopt—and this was clearly the fault of the Jews—more radical measures, and in the here and now, not in the future. The end result was four years of bitter fighting and the slaughter of tens of millions of innocent people. The thesis set forth by Stephen Fritz in Ostkrieg is so simple and compelling that it merits consideration even by those who have studied the topic for years.